OUYA is implementing some new rules to its "Free The Games" fund, which has been under fire lately based on the company's lack luster response to controversy surrounding some projects that are exploiting the program. 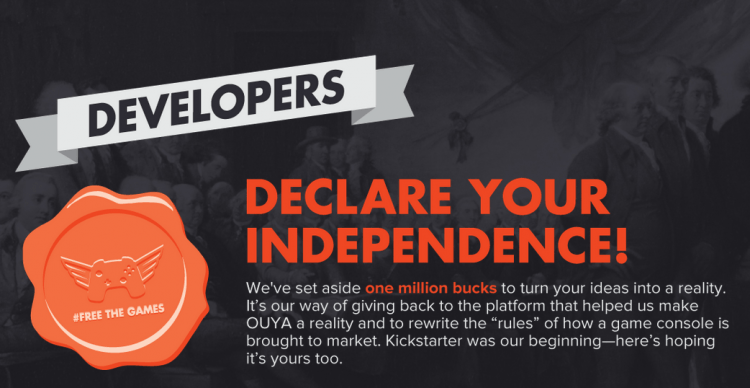 "Free The Games" is a fund put in place by OUYA that offers additional finding to Kickstarter campaigns that meet certain financial goals. Rose and Time developer Sophie Houlden, recently pulled her game from the platform because of the loopholes and lack of consistency in the "Free The Games" fund. She recently said, "it became very apparent to me that the company does not support indie developers who need the support most, and that they are incapable of ever correcting their mistakes. I’m simply no longer comfortable supporting the company." Although some developers are up in arms about the situation, OUYA does appear to be attempting to make things right. It will lower the minimum pledge requirement for the "Free The Games" fund significantly, from $50,000 down to $10,000, as well adding in preventative measures to mitigate exploitation of the approval process. Now, every $10k a project raises must have been pledged by at least 100 people. One of the biggest criticisms to come out of the entire situation was when the game Gridiron Thunder was successfully funded with $171,009 from only 183 backers. Gridiron Thunder has since removed itself from the program. There is also a new exclusivity policy that lasts for 1 month per $10K raised (for a maximum of six months). Lastly, OUYA said it thinks "it’s OK if you develop a PC version of your game. We want your game on the TV, but we also want your audience to grow. So, if you want to build a PC version at the same time, go for it." Julie Uhrman said that on top of the new policies the company will continue to manually review questionable projects. "You need to play by the spirit of the fund as much as the rules. We can't account for every loophole," wrote Uhrman. "So, if we, or our community, feel you are gaming the system, we will review your project (and consult with our developer friends for their advice) and determine whether to fund it or not." You can get more info on the official OUYA blog post.